This is the first game in the Diablo series. 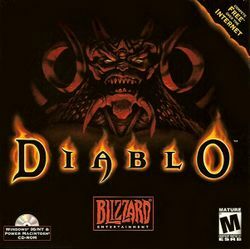 For other games in the series see the Diablo category. Diablo is a dark, fantasy-themed action role-playing game developed by Blizzard North and released by Blizzard Entertainment on January 2, 1997. The cathedral of the city of Tristram has begun cults of satanism and wizardry. With Archbishop Lazarus' betrayal, many have died, and Diablo, Lord of Terror, rises once again to release his nightmare upon the world of Sanctuary. The player takes control of a lone hero battling to rid the world of Diablo. Beneath the town of Tristram, the player journeys through sixteen dungeon levels, ultimately entering Hell itself in order to face Diablo. This page was last edited on 16 August 2016, at 14:47.